We’re going to go ahead and assume that you don’t have a gun, knife, or Hatori Hanzo sword sitting with you at your desk. After all, why would you? What are the chances of a gang of highly trained assassins rushing in and launching a high-octane super fight to a late eighties power ballad? But if that did happen—well, you’d have to reach for some improvised weaponry. 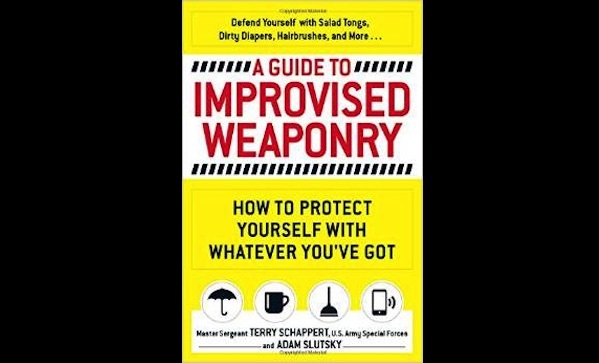 And A Guide to Improvised Weaponry, by Master Sergent Terry Schappert, US Army Special Forces, and Adam Slutsky, is the book that’ll help make things a little less improvised. Anything and everything. Salad tongs. PVC pipe. A garbage can. Car keys. A billiard ball. A dirty diaper. Basically, anything you can pick up in your home, office, car, or wherever, can be an improvised weapon. How do you use improvised weapons? Yeah, some suggestions, like hitting someone with the edge of your table tennis paddle, are entirely practical. Others, like using it to bat around flaming objects, are pretty far-fetched. Though awesome. Does all this stuff sound silly? No. Some of it, like the idea of using a staple puller to target your attackers surface veins, are right out of a Coen brothers flick. A Guide to Improvised Weaponry is a pretty good bathroom read and it will get you thinking about how to defend yourself. You probably won’t need to, and you may spend more time daydreaming about Hollywood-esque action sequences, but we prefer that to ever needing to own a weapon.